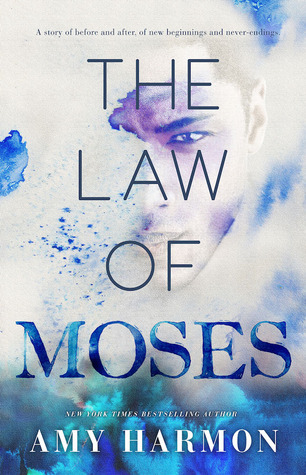 The Law of Moses is a very moving story by Amy Harmon. I have to say, this is the first book I’ve read by this author and it left me wanting to read more. A huge thank you to my favorite author and friend Shelena Shorts who recommended this book to me and lent me her copy. Wow. Just wow. There are laws. There are rules. And when you break them, there are consequences. Laws of nature and laws of life. Laws of love and laws of death. My brain might be cracked, but it’s not just my brain. The sky is cracked too, and I can sometimes see what’s on the other side. It is hard to write a summary; there is so much to this story and I do not want to give too much away. I have to admit, it was Shelena’s enthusiasm that really got me to want to read The Law of Moses. She was so right, it has it all: horses ( I love horses), mystery, & romance. And so much more. I just can’t wrap my head around how the author managed to intertwine so many stories and elements in one book. How?! How can one person come up with all that? I’m in awe. This story is so unique, in all the books I’ve read, I’ve never seen one quite like it. A very, very big compliment to Ms. Harmon. Wow. Just wow. And a very big thank you. Because the story is more than its summary, I feel the need to tell you a bit more than the synopsis mentioned above, but it is very hard to do so because the story is so unique, I really do not want to give anything away. In The Law of Moses, we meet Georgia and Moses. Georgia lives on a ranch with her parents where they help people using equine therapy. She first meets Moses when he moves to the small town she lives in. Everyone knows his story and she is warned to stay away from him. But Georgia, she just sees something in him and can’t leave him alone. Moses tends to lose himself in his art. He feels a need to draw and paint, which also gets him into trouble from time to time. Throughout the story you discover what happens to both Georgia and Moses throughout the years. Again: the summary really does not do this book justice. There is so much more, so many twists and turns. You just have to discover it for yourself, sorry, but you’ll thank me after reading. I would recommend this book to anyone who enjoys reading a book in the ranges of young adult, new adult, mystery, romance and/or paranormal. Even if you’re not into paranormal stories, I would recommend this book to you. Give it a try. I have to admit it took me a few chapters to get into this story it at first- it wasn’t love at first sight. I guess that had to do with not being able to personalize with Georgia as she is totally different from me. But once you get into The Law of Moses, you won’t be able to put it down. Just like me, staying up too long on the short night that is daylight saving time, ending up finishing the book in under a day. And if you do not fall in love with Georgia and Moses by the end of the book, you sure will fall in love with the formidable writing skills of Amy Harmon.